Alun and Sian Gerrard and their staff welcome you to Talybont Village Shop and Off licence. Situated on the main A496 coast road, four miles North of Barmouth, near the junction with the Beach Road. We carry a good variety of stock, newspapers and magazines, wines and spirits, groceries including fresh local produce. 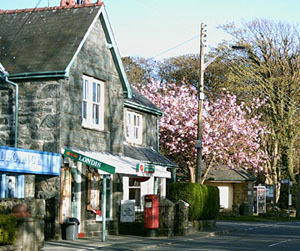 TALYBONT VILLAGE SHOP AND ACCOMMODATION IS NOW FOR SALE! CONTACT US AT THE SHOP FOR DETAILS.